After realizing that 4,382 students registered in less than a week to join Downey High School, Angelica Fregoso had the desire to go out there and spread the word about newspaper. She cannot wait to interview new students and write their stories to fit in with the others located in the Legends category. If she is able to promote newspaper to the students, then those students can read stories about others’ lives and view them differently. She knows how it feels to walk past students and not know who they are. During her freshman year, Fregoso moved to Downey High from St. Emydius, a private middle school, that only had about 250 students. During the middle of her sophomore year, former newspaper writer, Akhila Nalamilli, mentioned the Downey Legend newspaper with Fregoso. Fregoso's love for writing came to her when she was in first grade; as she started taking tests on The Magic Treehouse: Age of Dinosaurs, she loved the idea of being able to write her own stories and include her own characters and make her own world. It is not really a goal to write those kinds of stories to this day, Fregoso pointed out. Joining newspaper was to become open-minded and to write actual stories of actual people rather than typing fiction. Knowing how she had a flowing passion to accomplish this goal, Norma Fregoso, mother of Angelica, agrees that she can do it. Fregoso's writing also inspired her friends to improve on various things like essays and CQTs. 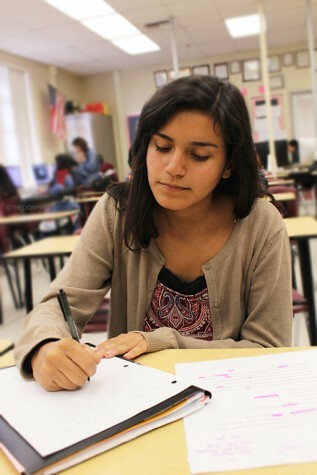 With much more to experience, Fregoso patiently waits for what stories she will be writing about in newspaper, and to obtain knowledge about the lives of students, teachers, and the citizens of Downey.